The project consists of approximately 47.7 acres encompassing both sides of the 0.87 mile North Fremont Street from the eastern City Limits west to State Highway 1. 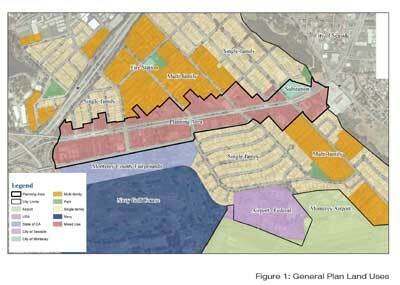 This map shows the Specific Plan Map in relation to the City of Monterey. The MND states, “The General Plan and General Plan Environmental Impact Report (EIR) assumes a development potential of l30 residential units in the Planning Area. The North Fremont Specific Plan build-out does not assume that a new water source is available for future development with the Planning Area...” (Introduction, p. 2). This is due to the lack of available water, requiring a conservative buildout projection for the specific plan. (Initial Study, p. 37) There are two different residential unit numbers (130 units and 260 units) both of which appear to be constrained by lack of water. CEQA Guidelines exempt residential projects consistent with a specific plan from future environmental review under specific circumstances (CEQA Guidelines, Sec. 15182). While the Initial Study indicates the specific plan will be updated when water becomes available, it should also identify that the specific plan as proposed is for 130 units, and that water availability allowing for more than 130 units will trigger an update to the specific plan.